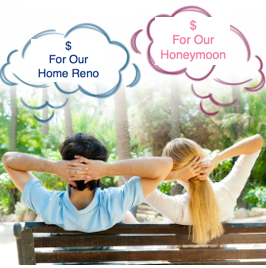 I have had fun speaking with couples at bridal shows all over the world who were planning their weddings and time and time again the discussion comes around to how to tactfully ask for money when getting married. Happily I would tell them how Eventastic could help! Younger, first marriage couples like the options of having both packaged gifts as well as money given as gifts for their wedding as they usually have not yet accumulated a lot of household items. Couples that are established in homes with all the basics say they more often they prefer cash gifts where they then can apply the monies as they need and wish. Couples have found it difficult to find tactful ways of asking for money and letting guests know it is their gift preference. Also, couples worry about the many stories of money going mysteriously missing in money baskets displayed at wedding receptions and speak of wanting a safe and better way of receiving the cash. Being able to request monies by telling guests what they plan to apply the funds to is much more palatable for the couple and the guests. Guests want to give something useful at a wedding and what better way than to be given options that the couple are saving towards and would truly appreciate. Eventastic is event software used worldwide for personal and business use. It is also an online solution for couples getting married; giving them a tactful way of asking for money from their guests through their customized wedding event page. Engaged couples make their free Eventastic wedding page where they can share wedding details as well as add various features to their page including dedicated cash gifting through the Guest Funding option. Couples upload pictures of things they are saving towards along with a description and guests can then click and safely give money toward items with which they choose to financially assist. Even guests not able to attend the wedding but wish to give something to the couple beginning their journey together appreciate this event page option. Here are the top categories of cash gifts that couples have tended to add to their Guest Funding feature on Eventastic. 1. Honeymoon: The honeymoon and subsequent excursion trips can be costly. Couples love having the opportunity to put pictures with descriptions of their plans/wishes and have guests contribute thus making it more affordable. 2. Vacations: Aside from the honeymoon there are always places we would like to visit. Never been to New York and would love a weekend away? This is a great opportunity to put a picture with description of the place and have guests help you achieve your vacation goal. 3. Home Mortgage/Reno: Whether assistance with the cost of a new home, mortgage or help in making the home more to your desire with cash gift photos of a new kitchen, wood flooring, new deck etc. .
4. Experience Gift: Maybe a cooking class, fitness membership, photography course, wine tour…there are always things we would like to learn more about. 5. Funds: Educational funds and retirement funds were on the list. 6. Charity: Couples love having the opportunity to give to a charity of their choice following the wedding. Eventastic is free for free events and makes event registration and management streamlined and easier to administer. Whether it’s a conference, seminar, fundraiser, sporting event, concert, birthday party or wedding related event, Eventastic is a platform providing an experience that can maximize success. Simply sign in and begin creating your own unique event page using a feature list such as photo sharing, video Youtube uploads, registration, ticketing, donation options, silent auction details and dedicated cash gifting. In addition, you can sell items on your event page and even add sub-events to your page like pre-wedding parties, speakers for conferences, musician pages for concerts etc. with all the details. Click here now and start having fun creating your event page!